Posh teenager Harry Anderson in action on his full debut against Scunthorpe. Photo: Joe Dent/theposh.com. Peterborough United manager Dave Robertson described his side’s 2-0 defeat at Scunthorpe United today (April 3) as ‘unacceptable’. The loss has pushed Posh down to 10th place in League One, four points outside the play-off places with just six matches to go. Paddy Madden and Theo Robinson scored the goals for a home side who hadn’t won for nine matches. 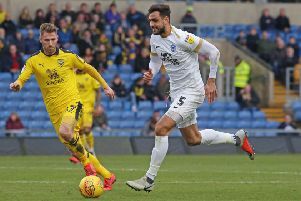 Posh barely created a chance against a side that had kept just two League One clean sheets all season as Robertson suffered back-to-back defeats for the first time as manager. Teenager Harry Anderson and on-loan striker Luke Williams were handed their full debuts. Posh are next in action when Walsall visit the ABAX Stadium on Monday (April 6, 3pm kick-off). “Scunthorpe are in a relegation fight, but they out-competed us and that’s unacceptable,” Robertson said. “Today’s performance was below par by our recent standards so we are all very disappointed. “I’m disappointed with the result, the performance and the fact that we played with no energy. It came as a complete surprise to me as it’s the first time I’ve had to say this about this group of players. They have mostly been brilliant for me. “We’re all gutted and we are now all determined to bounce back on Monday. It’s good that we have another game so quickly. “I want some players to be braver. I want Kgosi Ntlhe and Michael Smith to get forward more from full-back. I want them to take chances, to go deep into the opposition half and to try and get on the end of crosses as Kgosi almost did in the last couple of minutes. “We are still creating chances, but we are not taking them. I went three up top for the final 30 minutes to try and stretch them, but it just wasn’t to be today. “We had to make changes we didn’t want to make which was frustrating, but there was a window of opportunity for others and they didn’t take it. These opportunities might only come along once so you need to make the most of them. “I was disappointed with Conor Washington’s display as he didn’t offer us enough going forward and Harry Beautyman kept getting caught between lines so we didn’t pick up enough second balls and win enough battles. We lost the game in midfield in my opinion. “Harry Anderson coped well with his debut though. I felt his pace would help us get behind their defence. It didn’t work out like that, but the experience will do Harry the world of good. “It’s frustrating for me to lose two games in a row as that hasn’t happened before as manager and I’m determined to make sure there isn’t a third one. We’ll get things right. Taylor is expected to return to the squad for Monday’s game as will Gaby Zakuani who left the pitch with a head injury 15 minutes from time. Payne and Maddison will be assessed when the players next report for training on Sunday (April 5).